The long lasting materials are developed by Germany techology. 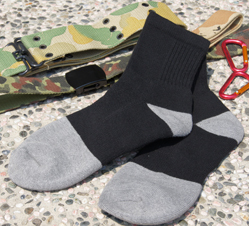 After special process, the socks are provided with powerful functions such as quick dry and easy to wash , and then to achieve moisture management and to eliminate from odor. Polypropylene(PP) with anion is an environmental friendly material with tender hand feel, anti-static electricity, antibacterial, keep warm, and quick dry functions.